It’s looking to be a very busy weekend ahead again. I’ll be performing at Savory Bistro in Mont Kiara on Friday, and on Saturday attending the biggest Oktoberfest Party in KL at One Utama. In the process of planning my small birthday thingy too. At this rate, I’ll probably just have it at Sid’s. I’m sure Frank would approve. Well, today is Recipe Day. I’d like to introduce Moussaka, one of my favourite Greek dishes, used to be a dish that’s in my regular repertoire come every winter. 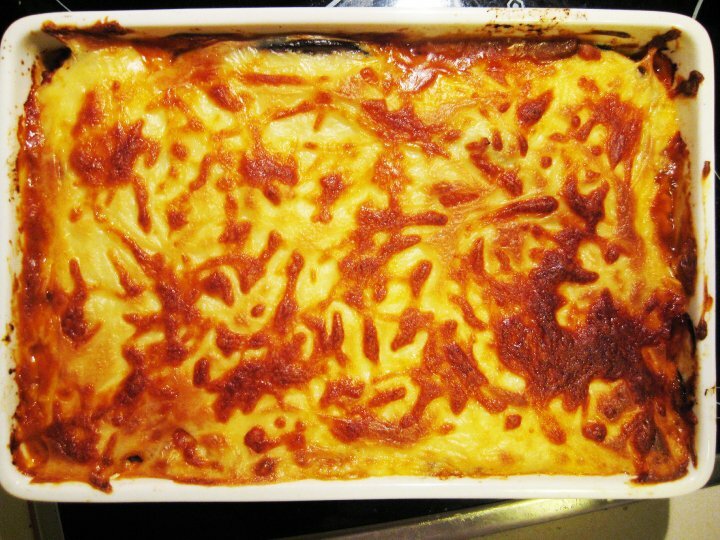 Frank used to request for it every so often, I’ve made it for Pot Luck dinners and had the guests singing praises, Frank even told George Calombaris when we met at a book signing that he must try my Moussaka (half-seriously). But now that we’ve moved to KL, it doesn’t appear as much. Perhaps we don’t crave such rich food often, but when I made it again, it definitely brought back a lot of fun memories. It’s marginally healthier than Lasagna without all that carb-y pasta sheets, as slices of pan-fried eggplant are used to layer it. In Greece, it’s usually made with minced lamb. However, lamb is not the most popular meat in our household so I’ve always made it with beef. It’s a little more labour intensive than Lasagna too, because you need to spend time frying batches of eggplant. But all the more satisfying. Cut eggplants into thin slices, place on wire rack, sprinkle with salt, and stand for 20 minutes. Rinse slices under cold water, drain, pat dry with absorbent paper. Brush slices with olive oil, add to pan in batches, cook until browned on both sides; drain on absorbent paper. Heat extra oil in same pan, add onion and garlic, cook, stirring, until onion is soft. Add beef, cook, stirring, until beef is browned. Stir in canned tomatoes, paste, wine, herbs, nuts, sambal oelek and all the spices, simmer, covered, about 40 minutes or until slightly thickened. 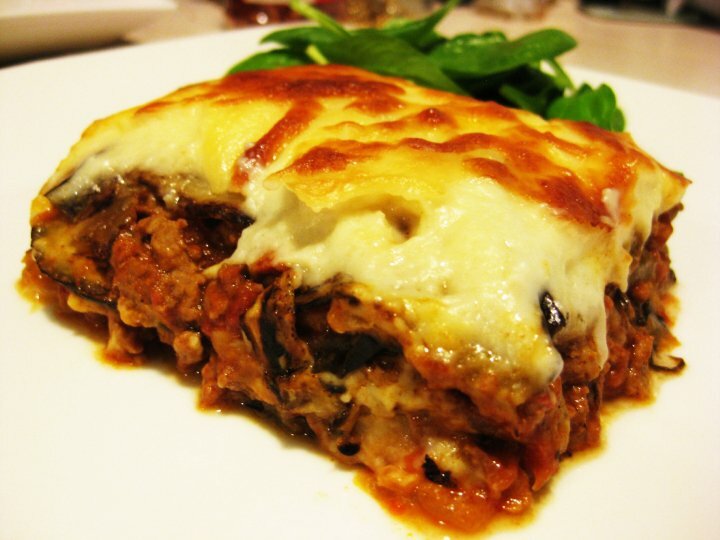 Place one-third of the eggplant over base of a Lasagna dish, top with half the beef mixture. Repeat layering with remaining eggplant and beef mixture, ending with eggplant. Spread Bechamel sauce (recipe to follow) over eggplant; sprinkle with cheese. Bake, uncovered, at 180°C for about 30 minutes or until lightly browned. Rest for at least 15-20 minutes before serving. Bechamel sauce: Melt butter in pan, stir in flour, whisk over heat until bubbling. Remove from heat, gradually stir in milk, whisking continously over heat until mixture boils and thickens. Remove from heat, stir in cheese; set aside. Note: Sometimes I throw in extra vegetables such as Carrot, Celery, Zucchini. Some people also use potatoes. Look at all that cheese! Ugly and Attractive at the same time. The best way to enjoy it is take a bit of each layer, close your eyes and let the flavours dance on your tongue. The soft and silky eggplant, slightly smokey, the spicy and aromatic meat sauce punctated with the piquancy of the tomatoes, and the creamy Bechamel sauce…. You might want to race for the second servings! But make sure to leave some for the next day, it gets better! So what’s your favourite Greek dish? By the way, have you voted yet? I would really appreciate your support, thank you so much! Wow great mind think alike! Ooooo…that certainly looks finger-licking good. Wish I could sink my teeth in it… Slurpssss!!!! I forgot to mention, this calls for those huge eggplants 😀 Let me know how it turns out. Hope you’ll like it. Definitely feels this way from time to time. if you never tell, i would have thought it’s lasagna. 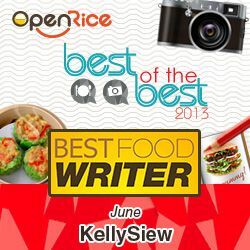 sounds delicious especially the sauce and a little suprise to see sambal oelek , must be really good!! btw, i forgot to tell you that i’ve made the braised noodles for the sarawak food fest and it was very tasty! thanks a lot! Glad to hear the braised noodles worked out well. Yeah if I don’t have sambal for the moussaka I’d just replaced with similar spice profile….. Thank you!! I wouldn’t mind some Roast lamb too… although my other half would probably run away in fear…. Basically a ground chili paste with garlic, ginger, lemongrass, sugar, salt and vinegar. You can substitute with any chili paste.